While I was away on a girls’ weekend in Maine, pulmonologist Tom was attending the annual Asparagus Festival in Western Michigan. Every year, eczema Michiganders celebrate the harvest with a parade, plenty of beer-battered fried asparagus and the crowning of Miss Asparagus. Good times were had by all from what I hear, and I got a spanking new “I <3 Asparagus” T-shirt. Because I do in fact heart asparagus, Tom brought a couple pounds home. Even after 14 hours of travel, they arrived fresh and crisp. So what to do with them? I decided on a risotto, and in my quest to try out risottos with all varieties of grains, I used steel cut oats. Yes, oatmeal. Savory oatmeal for dinner. I was a little wary at first, but it turned out pretty and delicious. Creamy, but not mushy. Tangy and decadent as its traditional counterpart, I love that I’ve added a new grain to the risotto roster. 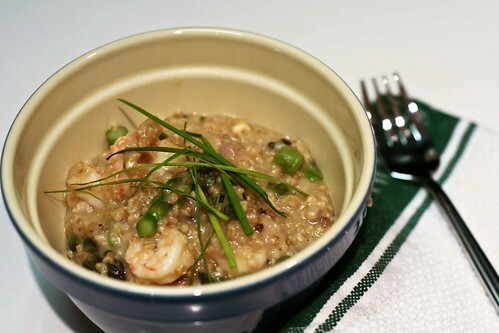 This is a fairly typical preparation of traditional risotto with the shrimp, asparagus and Pecorino mixed in at the end. Heat a heavy-bottomed, 5-quart pan over medium. Once it’s hot, add the butter and the shallots and cook for about 5 minutes or until the shallots turn translucent. Add the oats and mix them into the shallots, toasting them a bit – about 1 minute. Reduce the heat to medium-low and add the white wine, stirring slowly until all the liquid is absorbed by the oats. Slowly start ladeling the broth into the oats in 1/8 or 1/4 cup increments, stirring continuously until all the liquid is absorbed before adding more. Repeat this process until the oats are tender, but still a bit chewy. This will take about 25 minutes or so and you may not use up all of your stock. Add the shrimp and continue to simmer for about 5 minutes until the shrimp turn opaque, adding stock to loosen if necessary. Stir in the asparagus, cheese and lots of freshly ground pepper then remove from heat. Let stand for a couple of minutes, then serve in deep bowls. I love risotto! I would have never thought to put oats in it. Not sure, but, wouldn’t that make it gooey? It sure looks good! Chuck – I’ve been trying to use different kinds of whole grains as substitutes for the arborio rice. I was nervous about the oats too, but I think they work for a few reasons. The steel cut variety are much heartier, so they stay al dente if you take them off the stove at the right moment – giving you that slightly chewy sensation. Also, you wouldn’t be able to do a risotto with something that doesn’t give off that bit of starch to make it creamy. It wasn’t gooey at all, though I suspect it might be if you exclude the shrimp and asparagus. you described it perfectly enough for me to be willing to try this – creamy but not mushy. i would’ve put $$ down that it would be oatmeal-mushy but the pic doesn’t prove that! great idea. My long-distance, Internet cooking buddy and I did this as our weekly recipe last night. It was fantastic. Next up? ‘Butternut Squash, Farro and Sausage Soup’. Your site continues to inspire. I came across this searching savory oatmeal after mark bittman was talking about different preps for oats while on NPR. This is so good it’s ridiculous. What a great idea. I’m going to make this often. Thank you!